The psychological horror film was created by a team of mostly USC graduates, led by Aaron and Austin Keeling (BA Film and Television Production ’13), who both wrote and directed the film. The twin brothers collaborated with not only other SCA students to make this film possible, but expanded their reach to include collaboration between multiple schools in USC, including the Thornton School of Music and the School of Dramatic Arts. Other SCA graduates included Juan Sebastian Baron (BA Film and Television Production, '13) who was the Director of Photography, and Monique Thomas (BA Film and Television Production, '13) who served as Production Designer, Costume Designer, and Associate Producer. The haunting score was composed by two graduates of the Thornton School of Music's Scoring for Motion Pictures and Television program: Nathan Matthew David ('12) and Jeremy Lamb ('12), while lead actress Emily Goss graduated from the School of Dramatic Arts (BA Theatre, '11). Goss has won a total of three Best Actress Awards for her performance in the film. While the production was considered a DIY experience, with Goss and many of the crew living together in the “haunted” house during filming, the final product has become nothing short of notable after the success of its festival run. 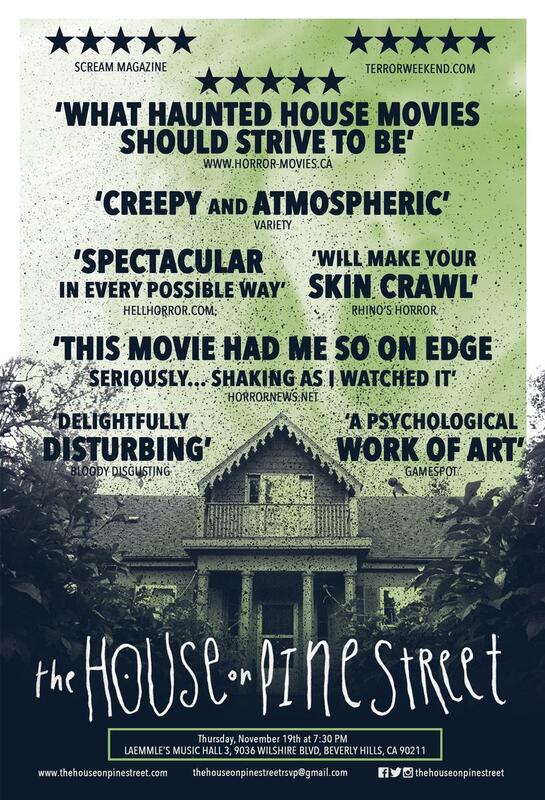 THE HOUSE ON PINE STREET had it’s world premiere screening at Cinequest in February of this year, also screening at the International Horror & Sci-Fi Film Festival and continuing on to be the Opening Night Film at FANT Bilbao in Spain. The film was awarded Best Actress and Best Narrative Feature at the South Dakota Film Festival, and Best Director and Best Feature at the NOLA Horror Film Fest in New Orleans, and more. The screening will be followed by a special Q+A with cast and crew, including the writers/directors the Keeling brothers, lead actress Emily Goss, and writer/producer Natalie Jones (University of Kansas, '12).